At the Episcopal Assembly recently concluded in New York City on Friday, May 28, His Grace Bishop BASIL was elected Secretary of the Assembly. 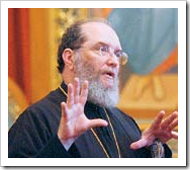 Reports His Grace, "I was nominated by Archbishop DEMETRIOS of the Greek Orthodox Archdiocese of America (Chair of the Episcopal Assembly), and Metropolitan PHILIP (First Vice-Chair of the Episcopal Assembly) seconded my nomination. I was then elected by acclamation by the 53 other bishops present at the Episcopal Assembly. I will head the Secretariat of the Episcopal Assembly which will be headquartered in the center of America's Heartland -- Wichita, Kansas." By decision of the Assembly, all organizations and joint action projects such as International Orthodox Christian Charities which operate under SCOBA, will function now under the auspices of the Episcopal Assembly. Newly formed committees will meet at regular intervals to discuss issues of common interest to all Orthodox Christians.